I know it's April now, but I'll post one last official "March of the Tools" post. 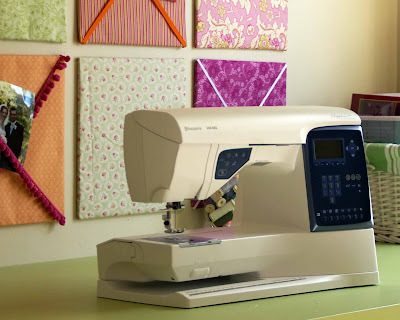 This is one of my favorite and most used tools: my sewing machine. My husband bought it for me to handle the type and amount of sewing I do. It's a Husqvarna Viking Sapphire and it's lovely! Nice tools you have there! I also like the fabric squares in the background. They look so pretty and neat. I like the fabric in the background too...are they just for decoration, or are they covering something like cork board?